Wondering what to do with all those gorgeous heirloom tomatoes you picked up at the Mountain Market in Marble Hill? 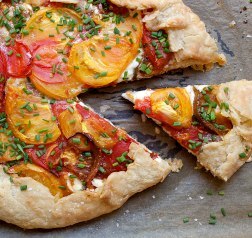 Try this scrumptious tart baked in a homemade pie crust with creamy ricotta cheese and plenty of juicy tomatoes. Stir flour and salt together in a medium bowl. Cube cold butter and cut into the flour mixture with a pastry cutter or clean hands until butter is in pea-sized chunks. Add water by the tablespoon until dough is shaggy and just barely sticks together. Scoop dough out onto a clean surface and fold into a loose ball. If dough is very dry, add more ice water by the tablespoon to proper consistency. Tightly wrap dough in plastic wrap and chill for at least 30 minutes (or up to one day in advance). Preheat oven to 400 degrees Fahrenheit. Slice tomatoes and place in colander. Season with salt and pepper and let drain for 10 minutes. Remove dough from refrigerator and roll into 14-inch round. Transfer crust to a parchment-lined baking sheet and drizzle with olive oil. Spread ricotta over dough, leaving about 2 inches of room on the outside. Dot cheese with sliced garlic and top with the salted tomatoes, overlapping them heavily into a single layer. Fold edges of crust up to create tart shape and sprinkle the whole thing with salt and pepper, to taste. Bake for 50 minutes, rotating once halfway to ensure even cooking. Remove from oven and let rest for 10 minutes. Garnish with chives and cut into slices. Serve immediately and enjoy!